Fernando de Noronha Island MAP. Master the map of paradise. Learn how to best explore Fernando de Noronha, with its beaches and a couple of main roads. 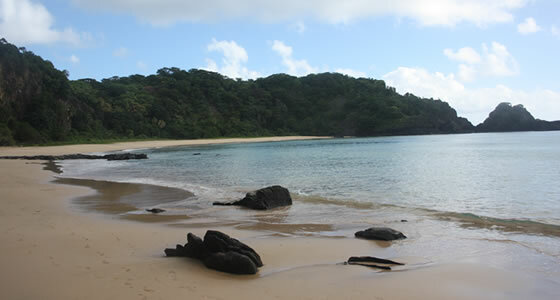 Fernando de Noronha can be divided geographically into two distinct sides. The north-western side, closer to the mainland has a more gentle approach, with flat beaches and is locally called Mar de Dentro (Inside Sea). The south eastern side, closer to the African coast is rougher, being bordered by rocky outcrops and is known as Mar de Fora (Outside Sea). The main road, the BR-363, is one of Brazil’s shortest highways, measuring only 7 km(4,3 miles) and runs from the Porto de Santo Antonio where boats anchor in the north-west, to the Praia do Sueste in the south-east of the island.